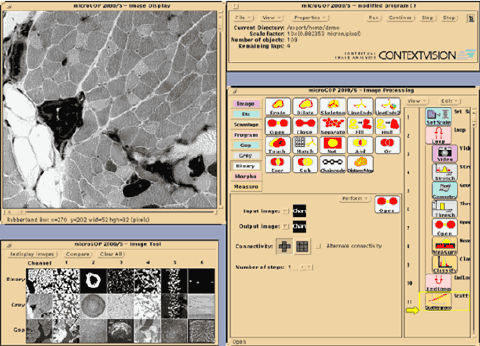 Ever since ContextVision started out in 1983, we have set the standard for image analysis. Initially, ContextVision made complete image computers, selling approximately 300 of them to different research labs in Europe. 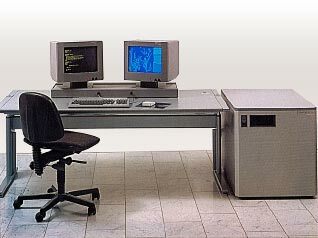 ContextVision’s first image processing system, including native hardware and software from 1985.
microGOP 2000/S, a general software product for analyzing microscopy images (1999). We have been leaders in image enhancement for almost 30 years, and we intend to extend that leadership into medical imaging applications of the latest technologies within artificial intelligence. We have therefore significantly increased our R&D investments over the last few years. We will use our proprietary technologies and artificial intelligence to strengthen our position in developing new innovative products. We have a world-class group of research scientists with expertise in image analysis and artificial intelligence technologies, most with PhDs in these fields. Our team continuously develops new methods and performs feasibility studies to keep abreast of the latest scientific developments and to contribute to research. We have a good track record for turning new technology into validated, trustworthy products. Our team has long experience of implementing various applications onto different hardware processing platforms. With our image processing software platform, it is easy to add new types of hardware to the product portfolio as requested by customers. The keys to our success in developing intelligent solutions are the skills of our R&D team, our company spirit and our collaborations with academic centers. In short, we are uniquely equipped for today’s and tomorrow’s challenges in the medical imaging field.